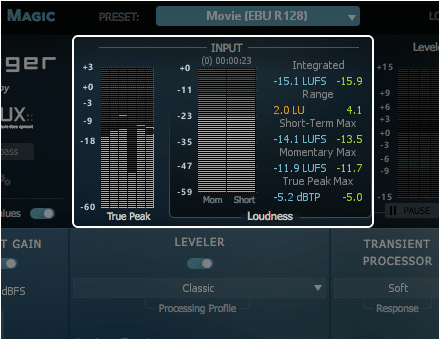 Level Magic is compliant with all current worldwide loudness standards. 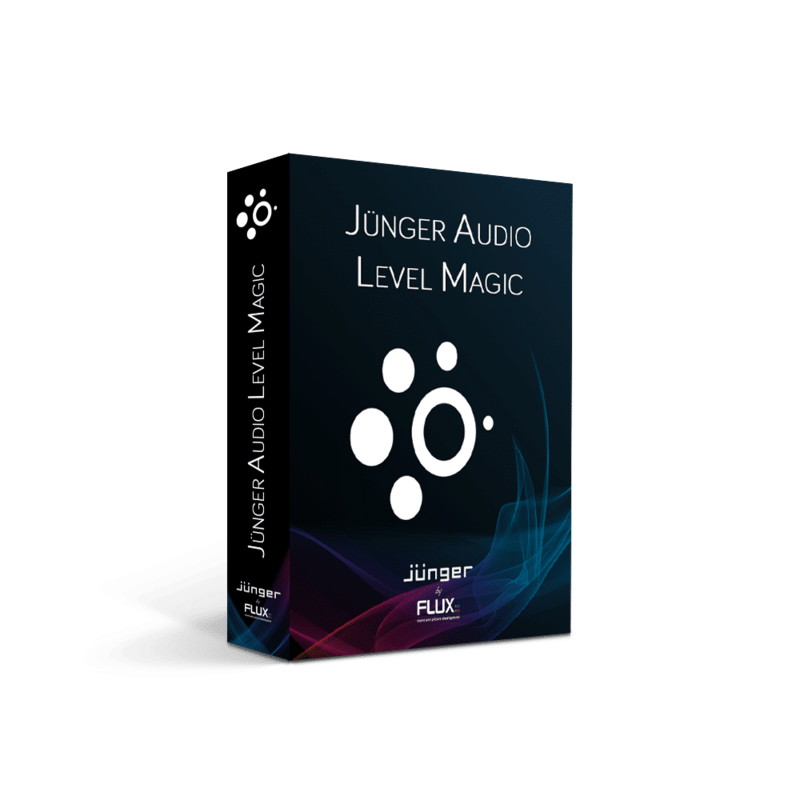 As a result of a joint engineering venture, Jünger Audio and Flux:: are pleased to provide the Level Magic for the first time in software format. 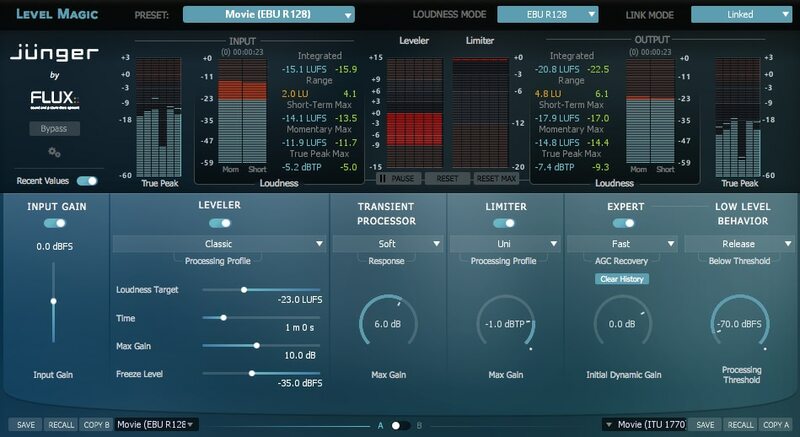 Developed and enhanced over several years, the dynamic range processor principles developed by Jünger Audio enable level managing devices like compressors, AGC and limiters to be produced with exceptionally high audio quality, without coloration, pumping, breathing, distortion or modulation effects sometimes associated with this type of processors. In short, virtually inaudible processing – With real ease of use! The built in preset manager and the preset switch, provides instant and intuitive control of all parameters and controls. The two Preset/Parameter slots, A and B, can be loaded with two full set of parameters at the same time, with a simple one-click operation you can switch between the two different presets to compare the result, even during playback. Established in Berlin in 1990, Jünger Audio specializes in the design and manufacturing of high-quality digital audio dynamics processors. They have developed a unique range of digital hardware processors that are designed to meet the demands of the professional audio market. All of their products are easy to operate and are developed and manufactured in-house, ensuring that the highest standards are maintained throughout. Their customers include many of the world’s top radio and TV broadcasters, IPTV providers, music recording studios and audio post production facilities. 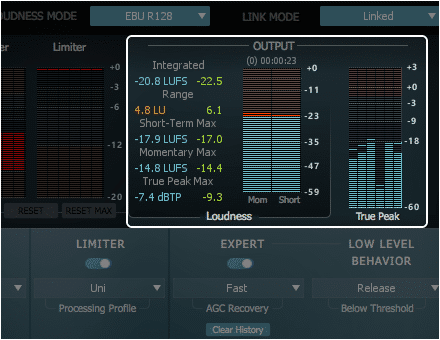 Comprehensive loudness management, algorithm highly adaptive to the structure of the incoming audio, without artefacts, compliant with all current worldwide loudness standards. Native Multichannel - AU / VST / AAX Native / AAX AudioSuite supporting up to 10 channels for Dolby Atmos and the AVID Pro Tools Dolby Atmos 7.1.2/7.0.2 Track and Bus. Windows - 7 SP1, 8.1 and 10 all in 64 bits only.